jadamsftbl | Analysis, coaching & psychology. Sitting pretty at the helm of League One, Wigan Athletic, with 15 of 23 possible clean sheets to their name, don’t have many concerns. The purpose of this article, however, is not to berate manager Paul Cook or the team, but to highlight why Wigan failed to create quality chances against Charlton, along with some potential solutions to inform Wigan’s approach against teams that set up similarly in the future. Shrewsbury and Charlton gained success with their approaches, both setting up in an organised block (albeit quite differently), and other teams will have taken inspiration from this, now knowing the blueprint to earn a point against Wigan. Shrewsbury defended actively, forcing Wigan into traps and pressing backwards passes, while Charlton defended passively, setting traps but remaining happy to let Wigan circulate the ball around the backline without providing pressure until the ball entered midfield. Wigan’s strategy to counteract Charlton’s passive approach was inefficient and ultimately led to Will Grigg feeding off scraps. Charlton defended in a deep 4-5-1 shape with an emphasis on protecting the centre by utilising a compact shape which spanned roughly the width of the penalty area, particularly uncharacteristic of a typical Karl Robinson side. For purpose of ease, Charlton’s compact shape will be herein referred to as a ‘block’. Through sustaining a heavy central presence, Charlton forced Wigan to the wings due to a lack of free men available in the centre. As the ball arrived in wide areas, Charlton applied pressure quickly to stop Wigan progressing through their full backs or wingers, which meant the ball was either played back into defence or clipped down the line for someone to chase. More often than not the ball was played back to the centre back, and the same pattern would occur on the opposite side after a switch, which played firmly into Charlton’s hands. Why, then, did Wigan struggle progress the ball through the centre more effectively? Although a compact low block is difficult to penetrate, there are ways of creating space within the block to allow for more dangerous central progression, but Wigan’s shape was not conducive to doing so. Generally, most of Wigan’s issues derived from a lack of occupation of the centre. As per the diagram (above), the positioning of Wigan’s players is a concern. There was mostly only one player, Powell, positioned within the block, which enabled Charlton to achieve their goal of defending the centre with ease. Morsy and Evans, the two deeper midfielders, took up almost symmetrical positions in front of Charlton’s midfield, failing to threaten any central progression. If Evans or Morsy received the ball, they were in positions to be pressed quickly without much need for Charlton’s shape to become disjointed. With no easy route to the centre, Wigan were forced to the wing, where Charlton set a pressing trap. Even when Wigan managed to beat the trap and progress down the wing, their lack of central presence limited them. Jacobs and Massey, when receiving the ball, often had no support from players inside Charlton’s shape, which left them isolated in unfavourable situations, leading to conceding possession or playing back into defence. A solution to this could have been that when one of Evans or Morsy dropped in front of Charlton’s midfield to receive, the other could take up a more central position. This would commit their opposing midfielder into a decisional crisis – press the player in front or focus more on blocking the passing lane to Powell? Either decision would benefit Wigan. Charlton’s midfield having to press the midfielder in front would open more space for Powell, and focusing more on blocking the passing lane to Powell would give Evans or Morsy more time with the ball to find a forward option. Passing backwards isn’t as disadvantageous as it sounds, serving the purpose of starting a new attack, but slow, continuous ‘horseshoe’ circulation from one wing to the other through the defence is largely ineffective. Wigan would play 4 or 5 passes only to end up in the same situation on the opposite side of the field, while Charlton only needed to shift across the pitch without expending too much energy or opening any spaces in dangerous areas. Another aspect of Wigan’s play that limited their ability to retain the ball high up the pitch was a lack of aggression from the full backs in their positioning. As Evans and Morsy often dropped into deep, wide positions between the centre back and full back to receive the ball under less pressure, Elder and Byrne could have positioned themselves further up the wing without risking too much defensive security. This would have allowed Wigan to use the wings effectively as a means of progressing play, however Elder and Byrne mostly received the ball in front of the opposing winger rather than beyond them, meaning the winger could easily force them back inside through closing the option down the line when pressing. By positioning themselves on the shoulder or beyond the winger, the full backs could have easily bypassed their respective opponent with their first touch. Perhaps the conservative positioning of Elder and Byrne was caused by Wigan’s own wingers being positioned directly in a straight line ahead of them. Jacobs and more so Massey generally hugged the touchline, which might have prevented Elder and Byrne from being more aggressive as it would have resulted in them occupying the same space. A solution to this would be for the near-side winger to move infield and the near-side full back to get high and wide. To provide balance and defensive security in case of a loss of possession, the far-side full back could move infield while the far-side winger could stay wider. Immediately, the near-side winger coming inside would provide Wigan with connections from the wing to the centre, which could result in the likes of Jacobs and Powell receiving the ball behind the opposition midfield, which is exactly where you want them to have possession. A final pass to get Grigg in behind would have a higher chance of success if it came from just in front of the defence in the centre, rather than from deep or out wide. Due to the improved connections across the pitch, with shorter distances between players and a stronger occupation of the centre, Wigan would have more chance of retaining the ball in dangerous areas. Having more players positioned within Charlton’s shape rather than around it would have forced many more decisional crises from the away side, which would have likely led to more defensive errors from them and would have helped to create free men in dangerous areas for Wigan. From the suggested changes, Wigan would have more clear routes to progress play upfield. The higher positioning of Elder and inside positioning of Jacobs would allow Wigan to overload Charlton’s right back, and the short option provided by Morsy would likely attract pressure from Charlton’s midfielders, opening vital space between the lines. By having players positioned between the lines, Wigan could switch the point of attack in more dangerous areas and, if done quickly, could potentially get Massey 1v1 on the right. Even if switches occurred across the backline, the shorter distances between players would ensure that the tempo of Wigan’s play could remain high. This was another key issue in the match, in that Wigan’s slow circulation of the ball made it extremely easy for Charlton to defend passively, shifting side-to-side. The reason for the slow tempo was mainly due to Wigan’s shape, as the distances between players were large and thus passes were slower, and the receiver of the ball therefore struggled to use the weight of the pass to take a positive first touch forward. A further issue was the lack of rhythm changes in Wigan’s possession. When, for example, Wigan made some spatial progression by switching play to Elder, the benefits of this were lost as he took too many touches and Charlton’s players could adjust their positions accordingly. Faster circulation, though, is facilitated by each player having multiple options in possession, something which Wigan struggled to establish throughout the match. Taking advantage of being able to progress into open space with the ball is a key factor in creating chances, particularly against teams that defend in a low block due to the limited amount of space that becomes available during the match. Taking fewer touches or larger touches can be the difference between beating an opponent 1v1 or having to turn back to play into defence. All was not lost, however, and Wigan did get some success on rare occasions when Evans committed his man through dribbling with the ball. If a team struggles to create free men through their positioning (i.e. between the lines, creating triangles), dribbling can be crucial to freeing up a teammate as it forces the opponent(s) to decide whether to press or drop, either of which cedes space and time. However, Wigan rarely took advantage of this, likely due to the deep, wide positioning of Evans and Morsy as it is a difficult position to dribble from, and the risk of losing the ball with little protection behind them might have arguably outweighed the benefit of freeing a teammate up. Wigan’s inefficient approach led to a change of strategy as the match grew on, with Cook bringing on Ivan Toney and Noel Hunt to give Latics more presence up top. Whilst I would argue that a front three of Grigg, Toney, and Hunt doesn’t contain suitable personnel to gain success from playing long balls to, particularly against a tall defence, Wigan created a couple of chances through Cook’s changes. Until Toney and Hunt’s substitution, Wigan lacked runs in behind. Due to their inherent danger, runs in behind force the defensive line to drop, and can lead to chances close to goal, space created between the lines if midfielders don’t drop, and can force the whole unit further back. Wigan struggled to get the likes of Powell and Jacobs facing forward in dangerous central areas, which may have contributed to a lack of stretching runs from Grigg and Massey as passes from deeper areas would prove extremely difficult. Wigan’s 7-0 drubbing of Oxford may also provide insight into why Latics have maintained excellent form away from home. Teams generally play more openly at home as opposed to sitting in a low block, and Wigan clearly excel when they have large spaces to work with. Jacobs, Powell, Grigg, and Massey provide a strong threat on counter attacks, coupled with Evans’ range of passing. Although all things point to Wigan being the best team in League One, be it the league table or underlying performance metrics, they will have to improve against teams that set up to defend for a point, of which we can assume the majority of teams visiting the DW will look to do from hereon in. Longer distances between players, leading to slower, ineffective ball circulation. Shorter distances between players, improved spatial occupation of the pitch, and more natural triangles and diamond shapes that are conducive to retaining possession and advancing with the ball. I wrote an analysis for Eat Sleep Drink Football on Inter Milan vs AC Milan, which took place on Saturday 15th April 2017, complemented with diagrams and videos. A laborious Wigan Athletic hosted Birmingham City in a fiercely contested Championship affair that ended 1-1. The visitors defended well to protect their lead until late on, but substitute Craig Davies snatched the equaliser for The Latics. Birmingham showed some good foundations of an effective away side, whereas Wigan showed good tactical flexibility that might see them through the season. Wigan came into the match with hopes of securing a consecutive home win after defeating a lacklustre Blackburn side 3-0 at the weekend, in which The Latics performed well for the duration of the game, and boss Caldwell would have been most impressed by how his side took control defensively. However, such is the diversity of the league that Birmingham posed very different question’s to Caldwell’s men. Looking to build on their 2-1 away win at Leeds, Gary Rowett’s side proved a tougher nut to crack. From the first whistle, it was clear to see that Birmingham had come to defend. Defending in a compact 4-1-4-1 shape, the visitors didn’t afford Wigan much space in the centre of the pitch. Wigan’s strategy to counter this was questionable, though, and they made themselves easy to defend against due to the predictability of their patterns of play and lack of tempo changes when circulating the ball. The Latics fielded a back three, so naturally found space to the sides of striker Clayton Donaldson when circulating the ball, even when Donaldson was joined by midfielder Davis during the press. Wigan often lacked presence in central areas, leading to stagnant build-up play. Unlike his right-sided counterpart Morgan, Warnock more often than not used his initiative to drive into the empty space in front of him in the left half space to progress the ball up the field. However, Warnock lacked options ahead of him and was forced to pass wide to makeshift wing-back Perkins early in the build up. Due to Birmingham’s good spacing and shifting towards the ball, coupled with the lack of Wigan presence behind the opposition midfield, Perkins was restricted to either playing the ball back to the nearest centre back or infield to Power or Powell, who would bounce the ball back into defence due to being pressured. Nick Powell often occupied the same passing lane as Max Power and would have been more effective if deployed higher up the pitch, but Birmingham were very content with shifting from side-to-side and pressing the ball carrier, and Wigan’s switches of play were largely ineffective. Yanic Wildschut was Wigan’s most prominent outlet early on in the match, drifting into wide left areas and using his strong 1v1 ability to get the better of Spector. Using an up-back-through mechanism can create space in central areas. Wigan needed more presence behind the opposition midfield line, and this could have been achieved by sacrificing a centre back and bringing on Jacobs as a number 10. Wigan’s early build-up play would not have suffered from losing a defender as Birmingham only really pressed the back line with one player, rarely with two, and Max Power could support the defence to progress play. Moving Nick Powell higher up the pitch would provide numerous benefits for Wigan. Firstly, this would enable Wigan to play through their opponents rather than around them, moving the ball into areas that would increase chance creation. This could have been done against Birmingham by using Gilbey and Powell in an up-back-through mechanism to create space in the centre, which may have proved fruitful if combined with an overload on Birmingham’s defensive midfield space. Birmingham played a zonal marking system with man-orientation, which meant that overloading Kieftenbeld’s zone would have caused problems. Second of all, having Powell higher up the pitch would provide more support for Grigg, and his presence between the lines could occupy defenders to free up the likes of Wildschut and Gilbey more often. Thirdly, Powell moving higher up the pitch would afford more space and time to Max Power in deeper areas, who could then find players in front of him more effectively. One of the greatest benefits of Powell playing higher would be the increased level of connectedness in the team: Powell could drift wide to support the wing-backs and combine with either Wildschut or Gilbey to provide an overload when the ball is in wide areas, and switches of play would be more easily executed. Keeping a back three and utilising Powell (circled) higher up provides more options for the ball carrier, potential overload situations, and allows for easier switches of play. Nick Powell has the potential to be a dynamic player but his positioning is often questionable. In early build up against Birmingham he would often provide a very similar passing option as Power, which in turn reduced the space for either of them receiving the ball and restricted Wigan moving the ball into key advanced areas. Powell is more effective further up the pitch due to his ability on the ball in tight spaces, which reflected in Wigan’s equaliser, where he played in Grigg, who crossed to Davies for the goal. Caldwell stuck to a three-man defence, though, and his decision to bring on Craig Davies rescued a point for the home side. As the game went on and Birmingham began to sat deeper, Wigan pushed for an equaliser but also looked quite fatigued. For a five minute spell, Wigan were playing in a 3-1-2-4 shape, with Powell joining Grigg up front, Wildschut and Jacobs playing extremely high and wide, and Power sitting behind Gilbey & MacDonald. This shape meant that Wigan were able to sustain pressure on Birmingham’s defence due to having better spacing and thus a faster, more effective circulation was possible, but the away side still closed important spaces. Wigan’s tiredness showed as their midfield struggled to continuously support attacks, which led to Caldwell changing strategy. Ultimately, the introduction of Davies meant both of Birmingham’s centre back were simultaneously occupied for the first time in the match, which led to the sub sneaking in at the back post to score a deserved goal. Birmingham had taken a controversial lead on the stroke of half time, which was surprising as not only did they have very little possession, but their deep shape and compactness meant that they rarely had an outlet when they won the ball back, so struggled to keep the ball well. However, when they opened up their shape and countered quickly, they were effective, hitting the woodwork twice. Their lead was controversial, though, as Donaldson appeared to be offside before winning a penalty from Bogdan. Not only that, but Davis, who scored from the rebound, had encroached in the box before the penalty had been taken. That is not to take away from Birmingham’s display, mind, as they defended very well for the majority of the match. They largely restricted Wigan to play in wide areas and forced them to use crosses as a means of creating chances, which proved ineffective as Wigan lacked numbers in high areas and Grigg was not all that successful in the air. Their defensive strategy may not prevail against teams with superior movement, though. Despite Grigg’s impressive hold-up play (for his physical stature), he is often outnumbered and isolated when receiving the ball, and a main focus point for Wigan will be the need to work on finding players in space behind the opposition midfield to improve their chance creation, as opposed to relying on the dribbling ability of Wildschut and using crossing from deep as a strategy. The progressive rise of interest in tactics has sparked much debate on social networks such as Twitter, with a considerable proportion of the debate centred around new terms such as ‘counterpressing’ and ‘half spaces’. Alongside the growth of interest in tactics is the self-labelled ‘modern’ Twitter coach – one that insists upon being forward thinking and open minded. However, despite the preachings of modern philosophies, there seems to be dissension over such new tactical terms. It appears that some Twitter coaches, those not in favour of new terms, cannot actually grasp the concepts and thus believe that excellent writers like Rene Maric of Spielverlagerung are simply rebranding concepts that already exist. For example, there has been confusion over the differences between high pressing and counterpressing, and channels and half spaces. To put the record straight, each term represents a different concept: high pressing is not the same as counterpressing, nor are channels the same as half spaces. Counterpressing – what’s all the fuss about? Apparently, counterpressing is a new term to describe high pressing, which means it is no more than a rebrand of the same concept, perhaps made up to help coaches and writers sound fancy. Rumour has is that the word is used in Germany, which, you know, makes it a buzzword. That is, of course, if you believe the ignorance implied on Twitter. The term counterpressing is actually a literal translation of the German word ‘gegenpressing’, which means pressing in the moment of defensive transition. That is, the moment the team in possession loses the ball, they press as opposed to getting into a deeper defensive shape. There are variations of counterpressing (leeway-oriented, access-oriented, passing lane-oriented and ball-oriented (once again, these are literal translations and not ‘fancy phrases’)), which can be read about in great detail here. The only explanation for the confusion I can think of is that due to counterpressing occurring in defensive transition, possession is often lost high up the pitch, meaning that defensive transitions start high up and therefore so does the pressing. Yes and no – context is key. If a team loses the ball high up the pitch and counterpresses then, yes, it is, in a way, high pressing. Alternatively, if a team loses possession in midfield or an even deeper area and still counterpresses, it is not high pressing but it is still counterpressing. ‘High pressing’ describes any type of pressing that occurs high up the pitch, whether that be in the defensive transition moment or defensive organisation moment, and that is probably where the confusion derives from. The term’s popularity has come from its repeated use in media circles, tactics bloggers and – you bet – on the pitch. Borussia Dortmund, Bayern Munich, Barcelona, Atletico Madrid, RB Salzburg, Ajax and Bayer Leverkusen have all used counterpressing in recent seasons with varying degrees of success and the high intensity aspect of it unsurprisingly encapsulates onlookers, not least for its entertainment value but for the appreciation of football intelligence on show. How can there be half of a space? If you thought counterpressing and high pressing was easy to mix up, then you have a lot of reading to do when it comes to half spaces and channels. I will gladly admit that I previously comprehended the terms ‘half space’ and ‘channel’ wrongly in the past, in this analysis of Atletico Madrid (in this image – I thought that the space between the centre back and full back was a half space, how wrong I was). After reading, re-reading and asking on Twitter, this piece on half spaces finally provoked my brain to make sense of a concept that I initially overcomplicated. My initial interpretation of half spaces, embarrassingly, was that they were channels. Thankfully, an epiphany moment saved the day and it finally clicked, to me at least, that half spaces are categorically not channels. The term half space translates literally, again, from a German term, ‘halbraum’. Much to the horror of fascist Twitter coaches, this unfortunately means that the term is not an ornate way of describing a channel, but rather a literal translation and nothing more. As Rene Maric pointed out, it is as good a term that is going to exist for the actual concept, as terms such as ‘half zone’ and ‘pre-wing space’ just don’t fit well. Half spaces and channels have been muddled all too much. 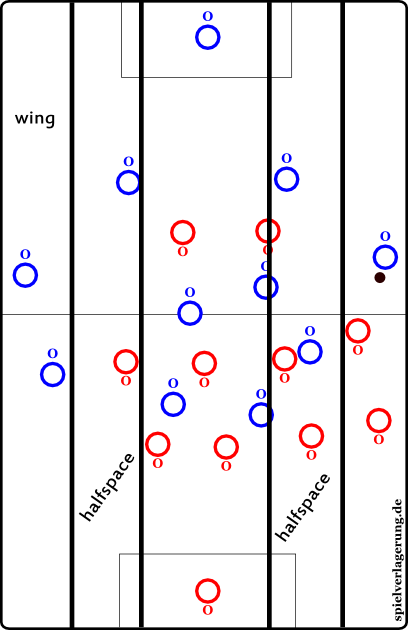 There are two half spaces on every football pitch on the planet, similar to how there are two wings and one centre on every football pitch on the planet – half spaces are merely fixed vertical strips in between the centre and the wings. By fixed, this means that the actual zone that the half space exists in does not move, regardless of team shape. That’s easy to understand, no? Why the confusion with channels? Well, channels are the gaps (or spaces) between players, and the most popular or well-known channel is the one between the centre back and full back. I can almost hear the shout of “work the channel” from that obscure Sunday League match right now. The commonly known centre back-full back channel often resides where the half space does, which has led to confusion and controversy amongst other things. The half spaces are fixed vertical strips that move for nobody. Not Lionel Messi nor Tony Hibbert. Nobody. Channels exist between players in central areas too, not just in half spaces or the wings. The space between the blue centre backs (above) is a channel, as is the space between the red left centre back and left back, both of which are in the central area of the pitch and not the half spaces. Hopefully that example has cleared up much of the confusion between channels and half spaces, which could lead to enhanced knowledge and potentially better coaching. The term half space has been used by the German FA for years and more recently by top coaches in the form of Jurgen Klopp and Lucien Favre, not just by narcissistic tactics bloggers. If the world’s best coaching organisation and proven managers are talking about half spaces, why the hell shouldn’t you and I? Understanding the concepts of counterpressing and half spaces can make you a better coach. Ever heard of the saying, “knowledge is power”? Rubbish – applied knowledge is power. Knowing the difference between counterpressing and high pressing, the variations of it and its benefits and drawbacks can be largely useful as a coach. Imagine knowing how to coach individuals and teams how to use one of the most powerful answers to possession-oriented football. Sessions could focus on training the rapid shift in mentality from attack to defence, or could revolve around the type of counterpressing to be used; and seeing players embrace a modern way of playing would be truly rewarding. Knowing the strategical benefits of half spaces in offensive and defensive moments would improve a system if applied correctly during training. For example, a session focusing on the positioning of players could have emphasis on certain players occupying a half space in various different phases of offensive organisation, which could lead to improved stability and connectivity in possession, as well as improved balance in transition. Applying the importance of half spaces could work wonders in defensive moments by facilitating the use of pressing traps (e.g. Wingers being half-space oriented in early opposition build up to isolate the wings before overloading when shifting over), better team shape and – heck – counterpressing could be worked on simultaneously. Twitter coaches’ biggest gripe seems to be that players would not know what such terms are, but as long as the coach ensures that players understand the actual concepts and the reasons for using them, it doesn’t matter how they are termed. There is no law stating that a coach has to call it counterpressing or a half space, but, for the sake of football, embrace concepts that are being delved into. Overcomplicating football? No. Understanding football and being a better coach? That’s your choice. This video highlights Red Bull Salzburg’s high pressing and its denominations, such as using counterpressing as both an offensive and defensive mechanism, which has been key to their domestic and European success this season. The video comes from the 1st leg away at Ajax in the Europa League round of 32, where Salzburg won 3-0.